Despite the anomaly surrounding its specific name, the largest-flowered of all the Babiana species is a rewarding winter- and early spring-flowering cormous plant for deep window boxes and pots, and sunny rock garden pockets in temperate climates. Babiana pygmaea is a very showy, deciduous winter-growing species, up to 120 mm high, with a small, deep-seated, egg-shaped corm surrounded by dark brown, fibrous outer tunics extending into a long neck and reaching just below ground level. Its four to five bright green, heavily ribbed, oblong-shaped leaves are oppositely arranged and covered with short, soft hairs along the ribs. The very large, regular, cup-shaped flowers reach up to 80 mm in diameter and are unscented and pale to deep lemon-yellow with maroonish purplish centres and prominent long, bright yellow anthers. The large, rounded seed capsules produce attractive dark brown, hard, angular seeds. The aerial parts of the plants desiccate in early summer and undergo a long dry, dormant period during the summer months. 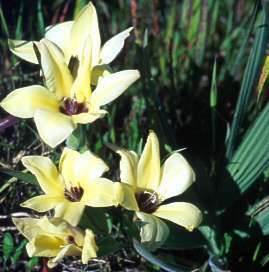 The genus Babiana is endemic to southern Africa and contains about seventy species, most of which occur in the southwestern and western parts of the Western Cape, and in Namaqualand. They are almost all winter-growing and generally flower in late winter and spring. The remarkable variety in flower shape and colour, from long and tubular to broadly cup-shaped, and from pure white through innumerable shades of yellow to blue, pink, mauve, purple and crimson, have endeared babianas to gardeners around the world. Many of the species have a deliciously spicy sweet scent. The popularly grown babianas in gardens are of hybrid origin, mainly between the numerous forms of Babiana stricta. Babiana pygmaea has a highly restricted distribution and is only known from a few sites in the Darling and Malmesbury Districts in the southwestern part of the Western Cape. Much of its former habitat has been given over to the cultivation of winter cereal crops such as wheat that thrives in the fertile, gravelly, clay soil in which B. pygmaea occurs. The flower spikes appear in late winter and early spring, blooming for a period of two to three weeks, and the plants occur in moist depressions on gravelly flats in full sun, in association with winter-growing annuals and other geophytic species. The genus name Babiana is derived from the Dutch baviaantje, meaning little baboon, and alludes to observations made by early colonists at the Cape of Good Hope, who noticed that baboons were very partial to the corms of this genus. Not surprisingly, the corms of most Babiana species are generally deep-seated and often occur in hard, stony ground, or deeply wedged between boulders of rocky outcrops in order to minimise the depredations of wild animals like baboons and mole rats. The specific name pygmaea, which means dwarf, or very small, is misleading and has a rather complicated history, briefly summarised as follows: the Dutch botanist Burman first described the plant in 1768, mistakenly under the genus Ixia, as Ixia pigmaea. Many years later the English botanist Baker mistakenly based his concept of this species on another Babiana species, the dwarf B. nana, that had been described by another botanist, Sprengel, and placed Sprengel's name into synonymy under Babiana pygmaea. Although the name pygmaea was misapplied by Baker, it has to be maintained as the valid name for this plant according to the rules of botanical nomenclature, which state that the earliest published name is the correct one. The flowers of Babiana pygmaea are pollinated by honey bees. The corms of several Babiana species are known to be edible, and B. hypogea in particular is known to have been eaten by indigenous peoples in the northern parts of South Africa. The corms of Babiana pygmaea are best planted in deep window boxes or pots, or in sunny, mole-proof rock garden pockets. An important consideration when growing this species is that the corms have to be kept completely dry over the summer dormant period, and the plants are thus not suited to general garden cultivation where indiscriminate watering takes place throughout the year. Cultivation in containers allows one to enjoy the vegetative growth, flowering and seed formation stages of the plants from autumn through winter to late spring, whereafter the containers can simply be dried off and placed in a cool dry location for the summer months. Plant the corms in early autumn, with at least 50 mm of growing medium above the top of each corm. An ideal growing medium should contain coarse river sand mixed with industrial sand (silica sand) and a little finely sifted, well-decomposed compost. When grown in rock garden pockets it is advisable to line the pocket with wire mesh in order to dissuade mole rats from gobbling up the delicious corms. The plants require as much direct sunlight as they can get, and benefit from a regular heavy watering once per week, if natural precipitation is lacking. In order to obtain pure seeds from container-grown plants, containers should be isolated and the flowers pollinated by hand. Seeds are sown in autumn, in deep pots, seed trays or raised seed beds, in the same medium recommended for adult corms. The seeds should be sown thinly to prevent overcrowding and the development of damping-off fungi, and kept moist by regular watering using a watering can fitted with a fine rose cap. Seedlings should remain undisturbed for two years, then potted up into permanent containers or into the garden at the beginning of their third season. Under ideal conditions, flowering may commence during the second season, but first flowers can usually be expected during the third year. Babiana pygmaea is frost sensitive and has to be grown in the cool greenhouse in cold climates. The corms of Babiana pygmaea are subject to infestation by mealy bugs, as well as to fungal rotting when cultivated in insufficiently well-drained growing media. Duncan, G.D. 1982. Ten Babiana species for promotion. Veld & Flora 68: 47, 48. Duncan, G.D. 2000. Grow bulbs. Kirstenbosch Gardening Series. National Botanical Institute, Cape Town. Du Plessis, N.M. & Duncan, G.D. 1989. Babiana. Bulbous plants of southern Africa. Tafelberg, Cape Town. Jeppe, B.J. & Duncan, G.D. 1989. 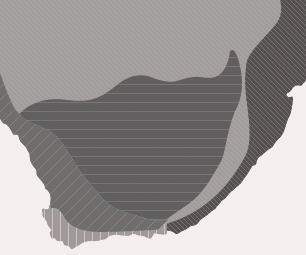 Spring and winter flowering bulbs of the Cape : 100, 101. Oxford University Press, Cape Town. Obermeyer, A.A. 1977. Babiana pygmaea. The Flowering Plants of Africa 44: t. 1731.